Lush Fab Glam Inspired Lifestyle For The Modern Woman: Preview Beyonce's 'Countdown' Music Video! Preview Beyonce's 'Countdown' Music Video! ﻿Preview Beyonce's 'Countdown' Music Video! Beyonce channels the 1960's beauty looks, including styles from Audrey Hepburn and flashes her growing baby bump in her upcoming music video for 'Countdown' from her latest Album '4'. Her bowl hair cut and mod makeup with bright green eye shadow and winged liner is now on our list of beauty looks to try. Take a look at the video-stills, teaser video and the official music video below. 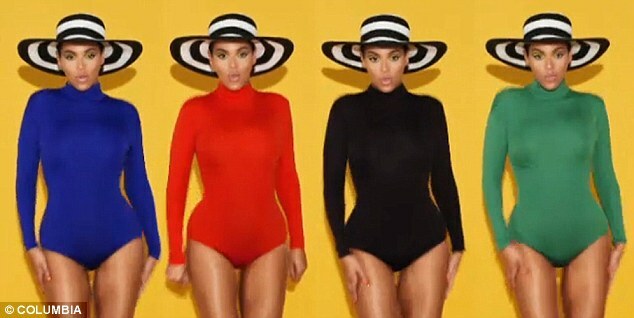 Beyonce in the Capezio leotard collection and Audrey Hepburn style floppy hat by Karen Keith for Patricia Field. Beyonce channels Audrey Hepburn's hairstyle and dance sequence from Funny Face. Beyonce in American Apparel sheer button up shirts. Beyonce shows off her growing baby bump in a Thierry Mugler hammock sleeved dress in the video, much like she did at the 2011 MTV VMA's. What do you think of Beyonce's 'Countdown' music video and teaser? Leave a comment below. Beyonce is so cute preggers. Going to recreate her makeup over the weekend. She looks good no matter what. B show them how it's done. Beyonce keeps working it big tummy and all. I luv the video only Beyonce can pull this off! B is glowing like crazy, pregnancy goes with you girl. Preggers and still killin it B is #1.